Daisy Toilet Roll/Magazine Holder. Provides style and function to your bathroom, especially if small. Daisy is flexible both in its form and function. 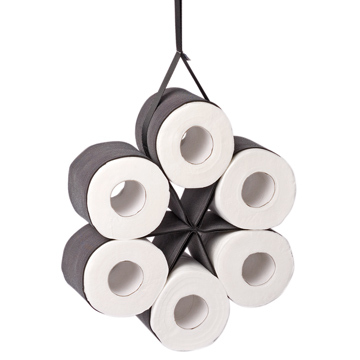 Made of stretch fabric, it can store 6 rolls of toilet paper rolls or 5 standard ones. You can even save useful accessories for the bathroom, and magazines. Ideal for bathrooms with limited space. It is hung or placed easily on the wall or ceiling.